A lady while searching her missing husband faced inhuman behaviour from the local police. Although her husband was an honest police officer. When she met the goon Saleem, came to know that they had killed her husband. Now Saleem is going to kill the woman but she managed to escape and took shelter in a temple. It revealed that she was pregnant. Few days latter the henchmen of Saleem hounded her and she hide herself under the river. 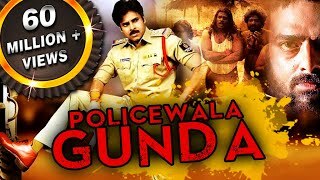 In this horrific situation she gave birth of a child, Komaram Puli, who will be the daredavil police officer in future.nnMovie :- Jaanbaaz Khiladi (Komaram Puli)nStarcast :- Pawan Kalyan, Nikeesha Patel, Manoj BajpayeenDirected By :- S.